Since the pumpkin beers started appearing on the shelves, I’ve been searching for the perfect pumpkin beer. I’ve found some good ones this season, but none that have really blown my mind. I was hoping Good Gourd would be the one that I was looking for. Pours orange in color with notes of buttered pie crust, roasted pumpkin, and a melange of pumpkin pie spices. Medium bodied with flavors of caramel and roasted pumpkin notes and an underpinning of floral hop bitterness that leads into a harmonious blend of pumpkin pie spice and finishes with drying alcohol heat that creates a balance with caramel in the finish. 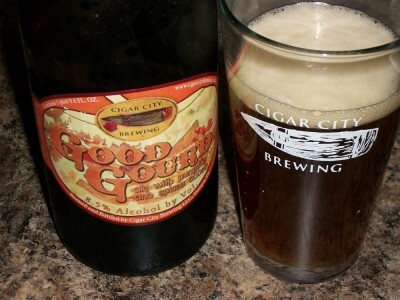 Good Gourd comes with the standard pumpkin ale ingredients like pumpkin (real, not artificial flavoring), and nutmeg. But they didn’t stop there, they also add three ingredients that were new to me: Ceylon cinnamon, Jamaican all-spice and Zanzibar cloves. I had a feeling that this beer was going to have a lot of flavor. In my pint glass, it smelled like a pumpkin pie with whip cream. It was hard to miss all of the spices coming from it. It tasted like a pumpkin pie too, but with a bit of a spicy edge. It was almost an overwhelming pumpkin flavor (a good thing in my my book), then the nutmeg flavor came out, followed by a creamy flavor. The spices reminded me a lot of their table saison that I had in their tap room earlier this year, but I couldn’t confirm if it was actually based on that beer. I’d even go as far as to call it a delicious pumpkin saison. Overall, Good Gourd earned a very solid 3.75 on the Passion For The Pint scale. It was very drinkable and good, although not exactly that perfect pumpkin beer that I was looking for. I guess I’ll have to suffer and keep searching.